Calm is the new Cool. So is Indulgent Nourishment and Radical Self-Acceptance. Join Hannah to receive instruction on how to create and claim more space in your life for your truest desires. 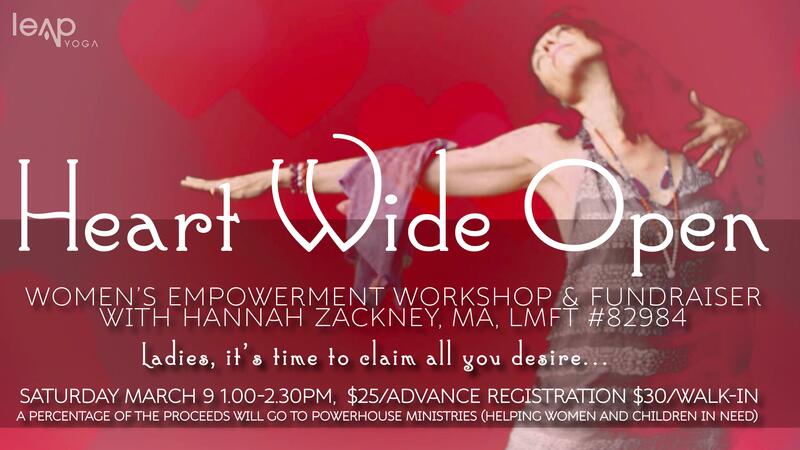 If you are yearning to live your most vibrant, free, empowered life, this workshop is for you. Begin to set boundaries that work (keep the good in and the ick out)Bring your journals, a pen and an Open Heart. Wear comfy clothes. This is not an asana practice but you may choose to bring your mat to sit on. Blankets and blocks will be available at the studio, chairs too. If you have attended a previous Heart Wide Open Intro Workshop, please note content has been updated and new material will be shared. *Note that a percentage of the proceeds will go to Powerhouse Ministries (helping women and children in need) **No refunds day of event.